Over the past 7 years WPsupport has encouraged many clients to migrate to the WordPress (PHP and MySQL) platform. Why? WordPress is simply an excellent website platform. For Advanced Custom Websites, Membership Website, B2B and eCommerce Website. Graphic Design. Logo. SEO. 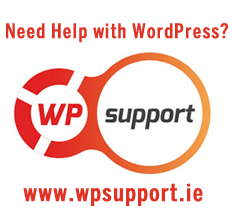 At WPSupport.ie, we are committed to get your website up and running within your budget.